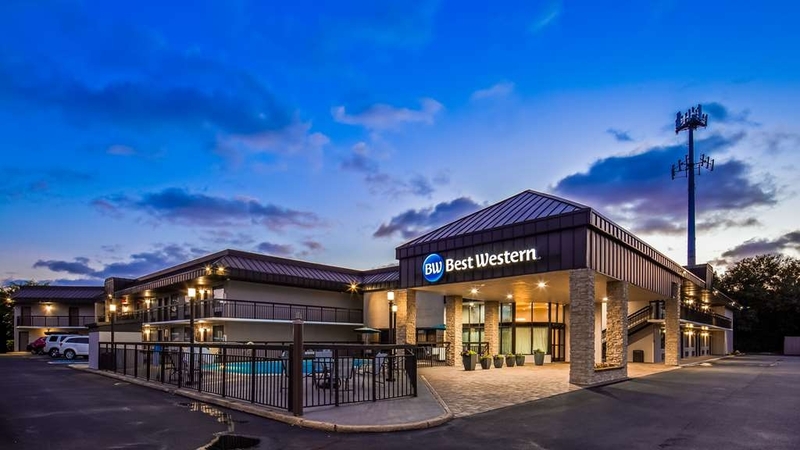 El Best Western Center Inn se encuentra en el centro de Virginia Beach. Venga y disfrute de las mejores atracciónes turísticas cerca de nuestro hotel. Precios bajos garantizados y ofertas exclusivas. Con una estratégica ubicación en Virginia Beach a poca distancia del túnel y puente de Chesapeake Bay, la Base Naval Anfibia y la Base Aeronaval de Norfolk, el Best Western® Center Inn es el lugar idóneo para viajes de placer o de negocios y un magnífico lugar para relajarse y descansar con unas fantásticas instalaciones y una magnífica localización. Disfrute de todo lo que Virginia Beach tiene que ofrecerle. A solo unos pasos de este hotel de Virginia Beach, Virginia, los huéspedes del Best Western® Center Inn podrán visitar el espectacular puente y túnel de Chesapeake Bay, tomar el sol en una de las numerosas playas de Virginia Beach, recorrer los jardines botánicos de Norfolk o contemplar los animales en el cercano zoológico de Virginia. El hotel está rodeado por atracciones locales, tiendas y restaurantes, por lo que nuestros huéspedes tendrán en su mano cualquier actividad que deseen realizar. 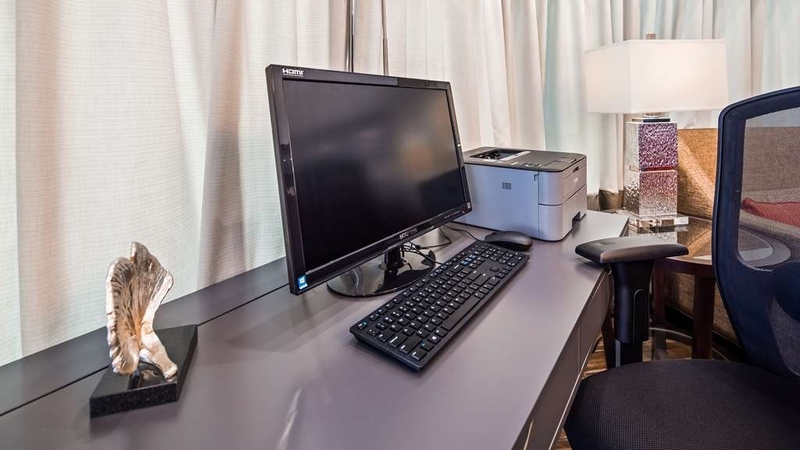 Los huéspedes que se alojen en este hotel de Virginia Beach podrán encontrar un servicio excepcional, unas instalaciones de primera y un destino imbatible con una excelente relación calidad-precio. Nuestras amplias habitaciones están magníficamente equipadas con televisión por cable vía satélite y acceso gratuito a Internet de alta velocidad. Entre otros servicios e instalaciones del Best Western® Center Inn se incluyen un desayuno completo gratuito cada mañana y una piscina al aire libre. Los huéspedes en viaje de negocios que se alojen en el Best Western® Center Inn apreciarán asimismo la gran cantidad de servicios de negocios del hotel y la proximidad al aeropuerto internacional de Norfolk, la Base Naval Anfibia y la Base Aeronaval de Norfolk. 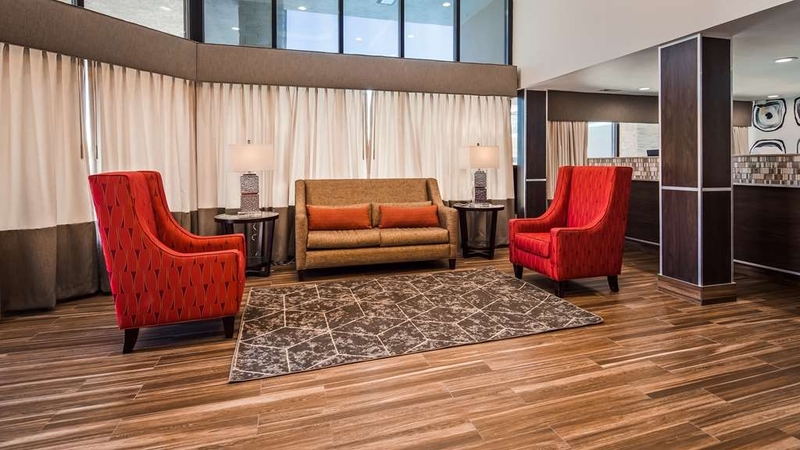 El cordial y eficiente personal del Best Western® Center Inn está preparado para garantizarle una agradable estancia en Virginia Beach, Virginia. ¡Haga su reserva hoy mismo y ahorre! Disfrute de su estancia en nuestro hotel. "Best Western not the BEST motel"
Mold to HVAC reported but not cleaned completely. Moved to 2nd room that was to be a"Clean" room. Mold and hair in tub, used soap on sink and on tub, previous guest toiletries left in room, sheets had hair and sock fiber balls, commode clogged before we used it, HVAC wouldn't stay on long enough to cool room. We changed sheets to have a clean bed to sleep in for the night. Room appeared to be updated. Room and bedding was clean. Refrigerator and microwave in room were nice amenities. Refrigerator ran loudly. Nothing fancy but worked for a solo trip in town for a sporting event. Breakfast was good, not fancy but ample. Overall no real problems. Wish they had a workout area. Great place to stay. Very friendly staff. They will go out of their way to help you. The house keeping staff is awesome. The grounds are always clean. The pool is always clear. Great location not far from the beaches and the shopping. Thank you Judy S for the kind review. We pride ourselves on creating a great experience for each guest. Please come again soon! "Don't book a room at this hotel"
Shannon G We are very sorry for any confusion over your recent stay at the Best Western Center Inn. We are a newly renovated property in mid 2018. We updated all areas of the hotel to include our common areas. In each room is a new TV, Bed, and even high speed internet access is available. We apologize for any feelings of the area you had but please know if you ever choose to stay with us again we are very safe and have never had any issues. Please if you have any other question or comments contact me at the property 757-363-2500. We truly strive to make every guest experience a positive one and apologize that we let you down on that front. Center Inn was immaculately clean with a highly professional friendly staff. The breakfast was fantastic! I would stay here an any time! Very enjoyable and comfortable stay. I will always support Best Western where I get more for my buck. Thank you Compass10084180704 for the amazing review. We are really glad that you noticed the hard work our staff shows to all our wonderful guests. Please make Best Western Center Inn your new Virginia Beach home anytime you find yourself here. "well renovated - total surprise"
We were quite pleasantly surprised by this very nice renovation. We spent a day at the beach and on a budget but still in a peak time of year, this looked to be a good bet. It was a great price, not a huge room , but comfortable clean, updated and near great places to go out. We would most surely stay again. Thank you beth a for the kind review. We are extremely proud of our recent renovations and were so happy to hear that you noticed the details that we have really tried to emphasize. Please make us your go to place when you are visiting Virginia Beach. Hope to see you soon! "I got a good sleep"
Thank you for staying with us and thank you for being a big part of what makes Best Western great! Please come again soon! Thank you so much for being apart of what makes Best Western great. We are all so happy that your recent stay was a positive one for you. Please come again soon! Had an awesome trip to Kingston. I was in town for a business meeting but had some extra time to enjoy the area. The hotel was perfect and easily had the best breakfast I have had at a hotel. Excellent dinning area and the food was great. Thank you for a great stay! A very nice added item that most people probably wouldn't think of, there was a small night light in the bathroom. A huge help in the middle of the night. Thanks for enjoying yourself during your most recent stay at the Best Western Center Inn. Please come again soon! Everything was great. Restaurant was very close. No problems except breakfast. I was really disappointed with breakfast. If you plan on cutting your expenses because of a hearty breakfast, forget it. Everything else was great. Thank you for the compliments. We appreciate you being part of what makes Best Western great! Come again soon! "A Great Stay in Virginia Beach"
We always stop at this BW on our way to the outer banks. The staff is helpful and friendly. The rooms are spacious and clean and we are close to Virginia Beach and the restaurants which we frequent. Oh the BE has a good breakfast too. Thanks for visiting again. We look forward to your visit again in the future! Room was clean, no odor, but TV wouldn't work. Had to get clerk come in took 20 mins to fix. Overall good overnight stay. Breakfast was great! I would stay at this location again. Gave out coupons to a local wonderful restaurant-Aberdeen Barn. GoPlaces45448119006- Thank you so much for the review. I'm very sorry about the tv issue that you encountered and will talk to the front desk associate you talk to, to better train them on the function and controls. Again thank you for taking the time to fill out the review and for letting us know how we can improve. Thank you for being a loyal Best Western guest. Hope to see you soon. There are a lot of choices in the area...mostly more expensive. My wife, daughter and I flew in for a funeral and to spend (4 days) some time with family. Great motel type property (we are usually hotel folks), up to date, very neat and very clean, both in the rooms and on the exterior. Excellent staff. Breakfast is basic, help yourself, a good selection. Excellent shower/head with great water pressure! Really a great value. Good internet. Nice diner ("POP's") in front of the property, it is not affiliated but also a great value. Pool was not open in November, but was covered for safety..
D2ski- Thank you so much for your kind review. It's guests like you that make Best Western great. We will let all areas of the hotel know the kind things you said and the areas you enjoyed(I too am a huge fan of Pop's Diner!). Again thank you for taking the time to fill out a review and thanks for making Best Western Center Inn your choice of stay on your recent visit. Hope to see you again, come back soon. "faulty toilet, no TV remote"
Personally biased to hotels with room access via interior hallways. This place was more a motel rather than hotel, so it started out with one strike. The toilet didn't flush unless you jiggled the float valve and the main valve leaked onto the BR floor. There was no TV remote and the desk clerk made me go down to retrieve a key to an unoccupied room to take that room's TV remote. Poor service. Only saving grace was the room was clean and bed was comfortable. Because of these things, we checked out early and cut our 2 night stay to 1.
ftct20- Thank you for your review and honest critiques. We will use these points to look at how we are doing and improve. I apologize for any inconveniences you experienced during your stay and we hope you will come again soon. Great location, easy access to many points of interest in the Norfolk/Virginia Beach area. Air conditioning struggled a little to maintain coolness, but was acceptable. Perhaps add some USB charge points in the room, that would be a big help for mobile devices. Thank you very much for your review and honest critiques. It is because of reviews like yours that we are able to improve and better train our team. I apologize for the issue with the AC and will look into that problem immediately, thank you for bringing it to my attention. Again, thank you for visiting and we hope to see you soon! This is a very basic hotel. Well worth the cost. All of the staff were very friendly and helpful. I had a one night quick stay. It was exactly what I needed and it's centrally located. I would stay again. Thank you for the feedback. Hope to see you again soon! Stayed two nights with my daughter while we visited Norfolk. This location was about fifteen minutes from downtown. The room was very clean and comfortable. The staff was very helpful and friendly. Enjoyed the stay. Will stay there again when in the area. A great place to get away from it all. Very restful and I have already booked my next visit to Virginia Beach for next year and I have picked the Best Western Center Inn, once again! For the money, and the location to where everything is in Virginia you cannot go wrong! Staff was very accommodating in allowing us to check in early after driving overnight. Room was clean. Only problem we had us that the room didn't get cleaned the second day we were there. After being out al day we needed to go back to desk to get clean towels at midnight. "Clean and comfortable,with friendly staff"
My stay stayed with the front desk person making sure I had everything that I needed, that I knew how long I would need to allow to get into town in the morning for my 1/2 marathon. Once in the room it was clean, smelled good and had a comfortable bed. This is where I would stay the next time I am in the Tidewater area! "We will stay here when we return to town!" Not easy to find - it is located behind Pop's Diner and not easily seen from the road. Once you find it, you are greeted by friendly, welcoming staff. The rooms are quiet and clean with comfortable beds. Breakfast was very nice with a selection of foods (eggs, sausage, cereal, pastries, fruit, coffee, tea, juices) that were attractively presented in a clean breakfast room. The pool was clean, towels were provided poolside. We enjoyed a swim. Parking is free and there is plenty of it. We will be happy to stay hre again. The staff were friendly and helpful with all needs. We got there later than estimated and were tired and cranky, but they smiled and made us feel better. The night clerk was knowledgeable about local eatery and recommended several close places, including the Pop Doc (not exact name) restaurant at the end of the parking lot. We walked over and got in just before they closed their kitchen and they provided good food and a carry out. The beds were probably the most comfortable beds we have had in any motel/hotel. All in all, a good stay and will consider staying on next visit to Virginia Beach. We were dropping our son off at college. I had a very fun and good night and slept well.The lights in the room my partner complimented, it was clean & conveniently located to where we were going. I would visit this hotel again though I was hoping to get room on the beach. Such a relaxing and comfortable stay! My boyfriend and I enjoyed our stay and loved the quality of the room and the beds! Housekeeping was so clean when we came back to our room! We would definitely come again! Great experience. Stayed 2 nights at reasonable rate. Attentive staff, clean room, nice breakfast, larger than average pool; good, central location for Virginia Beach- Norfolk attractions. Just off the Interstate. "Not the greatest Best Western"
We stayed for a night recently and were disappointed. We are Best Western members and often use the chain, and this was not up to par - especially for the money. I understand it's summer and this is about 20 minutes from the beach, but $200 for this old fashioned motel is way overpriced. It was clean, and breakfast was ok - but they initially assigned us a room that wasn't cleaned yet and we had to take everything back to the car and start all over. It was clean and breakfast was as advertised, but again no where near the money charged. Would not stay again. This was my first time staying at a Best Western and i have to say i was impressed. The hotel was very clean and the pool as well. The staff was very nice. The complimentary breakfast was very good. The hotel was in a convenient location to the beach and to the Veterans United Home Loans Amphitheater. We booked two rooms and were very pleased with the wonderful service. The rooms were clean and staff went out of their way to provide us with great service. We were able to check in early as our stay was for a family wedding. Great place to stay, VA beach just a 20+minute drive away. 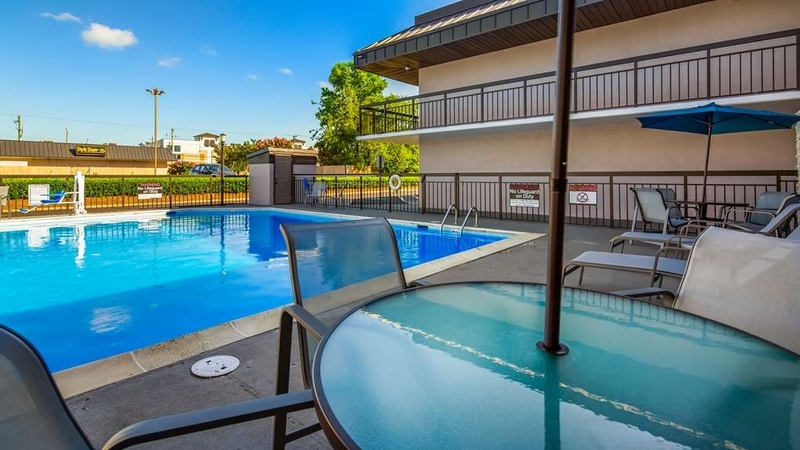 It had everything I look for in a hotel/motel: clean, comfy room, nice tv, good breakfast, free WiFi and parking, convenience, and bonus- outdoor pool! The rooms were very clean (they did a great job cleaning our room while we were out and kept us stocked with toiletries and clean towels). Flat screen tv, comfy beds, and hot water w/ good pressure for showering. We thought the breakfast was delicious with plenty of options. The staff was so welcoming and nice to us. I am not a morning person but the girls (that work there) made breakfast a pleasant experience. They were very thoughtful and considerate- they closed the blinds when they noticed the sun was hitting us in the face, cleaned up the waffle mess I made, and brought eggs to us as soon as they were done. Those girls that work there do a wonderful job, they made us feel very welcome- true hospitality! We would definitely come back, I have nothing negative to say about our stay here! Lovely friendly staff. Everyone reception, breakfast and cleaning. This is one of the cleanest hotels we've stayed in. Bit noisy room with very little parking. Great breakfast and inexpensive. For going to the beach area it's a drive and unfortunately there were roadworks. We arrived at 2:00am and were greeted promptly by the lady at the front desk who had all my information and the room ready on the spot. We woke up to late from breakfast but the lady in charge of the food served us anyway. She was super nice and attentive. The hotel was clean (bedroom, lobby and pool)! Great staff (no attitude and they are helpful), great breakfast. Smooth check in. I would recommend this hotel to friends and family members. I will also stay here again for my next visit. First time that we stayed at this hotel. Only twenty minutes from the ocean front make this a convenient location for vacationers. Pricing is excellent for being so close to a major tourist area. Rooms are newly updated and very nice. 10 out of 10 for cleanliness. The housekeeping staff is amazing and go out of their way to make sure all your needs are met. Beds are extremely comfortable. It is very quiet at night. This hotel is also Jeep friendly, allowing us to store our doors and top in the room with no issues. Daily breakfast is very good with a nice selection of items. Fresh coffee is available all day. 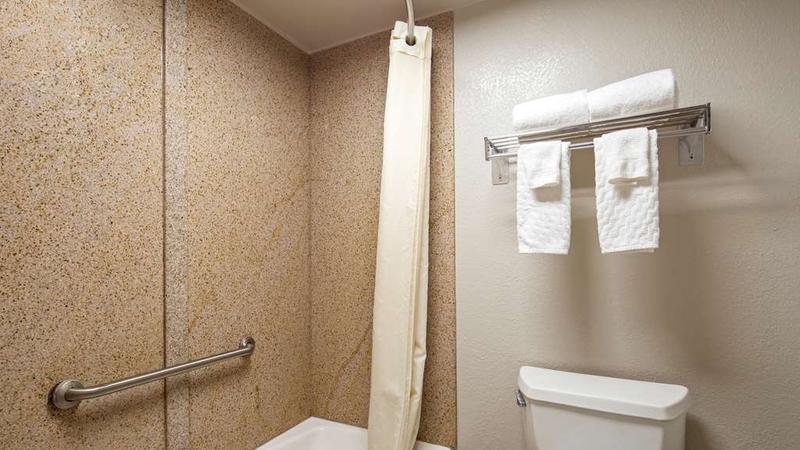 The only down side we found was the parking can be challenging if you want to park in front or near your room, especially if you return late in the evening, and the bathroom / shower area could use some grab bars and non slip mats in the tub. Overall this hotel scores a 9 out of 10 in our book. I would recommend it in a heartbeat. So the hotel was not hard to find. Our room was very clean, and we truly enjoyed staying here during our vacation. I booked a room here, because for the money it was a better deal. To be able to wake up and have a full breakfast was awesome. The attendants went out of the way to make us feel at home. Even to the point to make waffles for us. Never expected that, and it was awesome to have that kind of service . The hotel is about 20 minutes or so from the beach. They do have parking a block or so from the beach, and it was to pricey. Just enjoy it, I will diffidently stay there again if I ever go back to VA beach. The motel was great. Within walking distance to just about everything and 10 minutes to the beach. The motel itself is back away from the main drag, so none of the noise that goes along with it. Very friendly staff. Pool was open which was extra great. I am normally a Hilton person, but booked last minute here. Was very impressed with the stay and everyone I interacted with. Breakfast was good for the price of room, beds were firm (which is a plus for me as I do not like sleeping in soft beds) and everything else worked out great. Would definitely consider staying there again when I visit the area once more. "4 days trip at virginia "
Signs of blood on the bed and lipstick smeared on the towels. Not good. Please have clean sheets and towels. You nearly drove my (Philippine) wife crazy. Please try not to push housekeeping too much with quotas. It starts to show on the cleanliness of the rooms. Stayed her for a couple of nights. The staff was wonderful. The pool was clean an well kept. The rooms were newly renovated and very clean. I was pleasantly surprised with my stay here. The hot breakfast was actually pretty good. One of the better continental breakfasts I have had. Getting into the parking lot is a bit knuckle whitening with traffic but overall it was a peaceful stay. 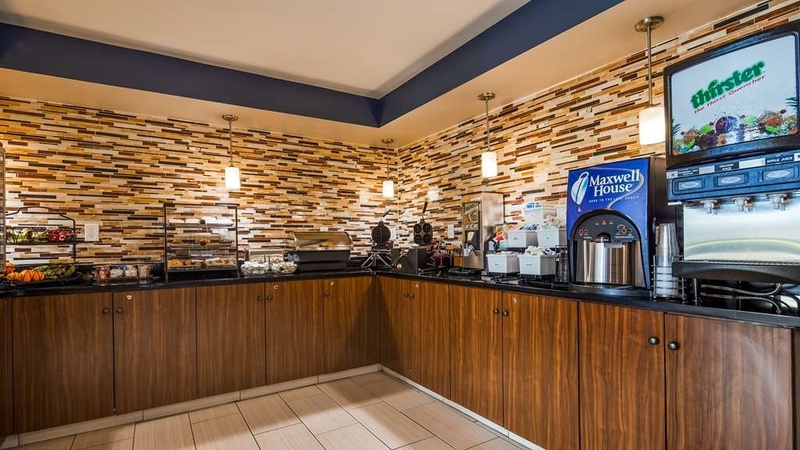 Ps...take snacks, there is a soda machine and an ice machine but if you want snacks you have to go to the front desk and pay for what limited choice they have on hand. No snack vending nachine. "Best hotel near Kings Island!" My family and I truly enjoyed our stay at Best Western. 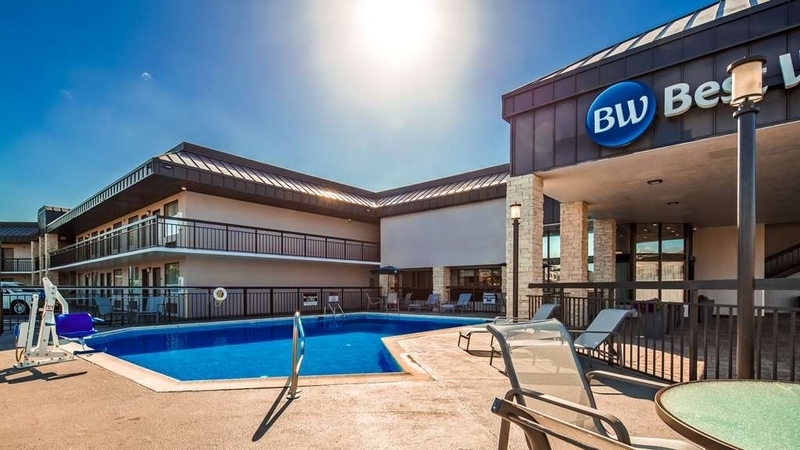 This hotel offers a clean pool and spa, comfy beds, and a great breakfast selection. We were able to get where we needed to go in just a few minutes. There were also plenty of restaurant options nearby. The hotel staff was super friendly which is awesome when you're on vacation. The room was clean, except I think I got bit by a bug. But bugs are everywhere so I can't complain. They forgot to clean our room one night but I still can't complain because I don't mind. The room was nice and big. The bed was comfortable. The shower had great water pressure. The toilet made a weird noise when we flushed it. The tv channels rocked. The pool is nice. The location is about 20 minutes from the “good” beaches. I enjoyed it. "Hotel is good front desk staff unfriendly"
Front desk staff was not friendly at all, maybe she had a bad day. The person in the breakfast room was friendly and helpful. She always had a nice attitude toward her guest. She made our stay enjoyable. We usually stay in this hotel once a year. We were pleasantly surprised to find the hotel rooms have been updated. The rooms look fresh, modern and very appealing. Staff has always been very helpful and continues to be so. The breakfast didn't seem to be up to its usual standards but was still good. Staff is very courteous and responsive, which helped make my stay pleasant--in fact, the customer service was much better than I've received at some hotels that are far more expensive. Overall, there were no issues throughout my stay. If traveling to Virginia Beach again, I would choose the same hotel. Difficult to locate. Breakfast was just o.k.. Counter availability was marginal. No one at front desk when we arrived. Probably would not return to this location. G.P.S. misdirected us due to a spelling error,in rain and high rate of traffic. Traveling from central New York to Charleston with another couple, we took 2 rooms at this hotel. It had all the amenities we expect from a Best Western inn and at a very low price. The staff was helpful and friendly and the accommodations were very comfortable. Front desk--excellent. Kitchen--outstanding. Great people work here. We will be back. Location was easy access with plenty of restaurants in walking distance. Access to many attractions was easily available. Very clean room with well equipped coffee machine. "Newly renovated! Everything looks clean and great!" Newly renovated! Everything looks clean and great! Everyone is friendly. It feels like I am visiting family each time I go there. They are even nicer than my family! I hope they keep the people that work there. They are what makes the place special. This hotel is located in a good location, where you can get to many resturants in less than half hour. there are other attraction in the area. The staff is very friendly, room where very reasonable. service was good.safe comfortable environment. good quick breakfast..
"Great value and friendly staff." This is a very nice hotel with a very helpful staff. The room was clean, looked like it had just been redone, the breakfast was very good and the ladies taking care of it were friendly and helpful. For the price we were very pleased. In town to visit family and stayed 3 nights at hotel. Nice clean room with good hot water and good mattresses. Breakfast was good. Staff was great and especially the ladies working the breakfast area. Both were very cheerful and helpful. Only drawback was difficulty finding the hotel after dark the 1st night and traveling east on main road. Excellent customer service, friendly staff and great breakfast buffet! The room was clean smelling and the showerhead was amazing. The pool was closed for cleaning. Only stayed one night and the first time in the Virginia Beach area. Hope I'm able to have the full experience next time. "Good place at a great price"
I stayed one night in this hotel, and it was a pleasant place to stay. It was quiet, the heat worked, there was decent (but not spectacular) WiFi in the room, the sink, tub and toilet all worked the way they're supposed to, and the bed was reasonably comfortable. The clerks behind the desk were friendly, and the woman working in the breakfast room was exceptionally helpful and kind. For lunch and a more elaborate breakfast, there is a nice diner right in front of the hotel that you can walk to in a minute. I would definitely stay at this Best Western again. We stopped here on a trip thru for an overnight stop. You could miss it if your not paying attention. The exterior doesn't do justice to how nice our room was. Not that the exterior is horrible it's just very l8w key. Our room was very clean, bed very comfortable and breakfast was good with good coffee. I wouldn't hesitate to stay here again. "Couldn't find the place "
I stayed here last weekend, was surprised to find it under renovations. Lobby was nice. Our room was ok, still needed a few touches from the updates. Towels were stained and hand towel ripped. Maids left our door open after cleaning it which we found when we came back in the afternoon, was going to call the office but the phone didn't work....a/c didn't work right either. Office acted concerned, but not really, told they'd make a note of it, when I checked out they hadn't a clue anything had happened. Oh well.....still a Platinum Member! If you are a family with babies very small children and need a microwave the heat bottles or food in your room this is not the place to stay the only microwave is in the lobby. The hotel is clean the staff is friendly.. The staff is very friendly and helpful. What ever you need they do their best to make the customers as happy as possible. The house keeping staff are very friendly and helpful. They are remodeling the hotel the new room are nice. "Being redone - maybe good in future"
I was surprised when driving up to hotel that it was being remodeled. The front door lobby had a sign to go to back but had a hard time figuring where to go in. There were workers putting in new beds and painting but they did not speak English. After finding the lobby a young lady uncovered the computer to log me in. The lobby smelled terrible of paint. We were directed to a room in front that after getting to it really wasn't bad, it was comfy, lots of pillows and very decent even though that was not redone yet. There was no airport shuttle as mentioned but had a very early flight anyhow and was out by 5 am. I did not see a restaurant on premises but maybe after they are remodeled. Overall still good for price. The receptionist called to see if the room was okay after noticing I was not happy at first with situation and being unaware of current status. This hotel always gives me the best value and the best service of any in the area. They always seem genuinely happy to see you return and go out of their way to make you feel welcome from the time you walk in the door. No problems with the room or staff. The walls are THIN! Its an older looking hotel, the rooms are smaller than other hotels of same quality and rating. But no1 ever bothered us, and overall the experience was enjoyable. "A Hidden Location with dependable service"
The location is a bit hard to find; however, once you handle the access roads, you are in a remarkably quiet location. Road was clean and adequate. Even though the on-line reservation indicated a smoking room by error; the staff quickly substituted a non-smoking room without any delay or hassle. Breakfast was hot with eggs & some meat each morning. The service personnel were very helpful and friendly. "Spend a little more for a better place"
Don't stay here. It's just not worth it. Spend $10 more dollars to stay at a Holiday Inn or something uo the road. You'll be glad you did, the overall quality of everything in this room was sub par. Trust me. Clean hotel, courteous staff, decent breakfasts, and wonderful kitchen workers--especially mother/daughter team, Cynthia and Jessica! Primarily because of Cynthia and Jessica, I recommend and would return to this particular hotel. These ladies definitely deserve significant promotions and pay raises!!! The front desk, housekeeping & kitchen staff were great. Cynthia & Jessica prepped the daily breakfast & went beyond to ensure it was done right & we were happy. The building itself was a bit dated but it was well cared for & our room was clean. I will stay here again. Clean Hotel, Clean Room, Nice Staff, Great Breakfast, and most of all, GREAT price. Only drawback, as in ANY hotel, the folk who stay there that drive large vehicles, Trucks, Camper, Construction Workers, don't like to walk from an auxiliary parking lot and they triple/quadruple/or more park their rigs, taking up space that 3 or 4 cars could use. Still, I will use this hotel again! "Great Motel for the money"
Friendly front desk clerk, decent breakfast, and pretty large room made this hotel a great value. You can tell that someone is trying to maintain this as a nice place to stay because it was very clean. Dirty, dusty, uncomfortable, possibly bed bugs. Contacted Best Western directly to address these concerns and no reply. Everything was bare minimum when it came to the staff. Disappointment all around. I would recommend this hotel. Although it's an older Best Western and has outside entrances, I felt very safe and relaxed. I would definitely recommend a stay there and I know I will be staying there again!! Stayed 3 nights during trip for our granddaughter's wedding. Really prefer oceanfront hotels when in Virginia Beach, but the cost was prohibitive this time. Best Western Center Inn is older, dated, not the greatest part of town, but the service and cleanliness was very good. All the staff was so helpful and nice. The breakfast was good. Overall, a great stay. I'm very pleased with my stay at this hotel. It was a steal at $71 on a Saturday night. The room was clean and the staff was friendly. This is the place to go if you're looking for a quality, affordable option. The hotel is very clean, the staff are very professional and helpful. Free breakfast was good. The internet was excellent, room was clean, Lots of cable channels, iron and iron board, and good refrigerator. Close to naval bases. I would stay again. The check in was nice and easy. Desk person was so helpful with information. The stay was great. Breakfast staff Jessica W also full of information about the area and made sure we were satisfied with our breakfast. I would stay there again . The rooms were clean for the most part. Microwave and fridge weren't as clean as I'd like them to be so I didn't use it. The guys next door decided to have a party all night long and the walls are fairly thin. So I practically heard everything, luckily I was really tired and fell asleep quickly. I'd stay here again. Stop for one night during my trip from New Jersey to North Carolina. Room was comfortable and clean. Although the soundproofing could be better the room was very well appointed. I will stop here again. OK for short stay. Comfortable bed and room; breakfast included homemade waffles, fruit, pastries, eggs and meat. A good value outside of the "holiday" window, i.e. before Memorial Day, after Labor Day. This is a decent hotel with a free shuttle near the airport. Room was clean and had full kitchen. It is not near much and no restaurants (other than nearby hotel) nearby to eat at. It fit the bill for a one night stay due to a flight cancellation. Priced right. Room not ready over an hour after check-in. Friendly clerk, I accepted another. Bath mat was folded on tub but soaking wet. Microwave had been punched, inside film peeling and dirty inside. Didn't like the connecting room but first night quiet. Bed very comfy. Early Monday morning dumpster being emptied woke me up. Breakfast sausage microwaved, didn't look done but rest was good. Shower good and hot. Plenty of outlets. Maid friendly. She didn't clean our table, still had syrup on it and she didn't give us more plastic cups or refill our facial tissue box in the bathroom. Towels/was and face cloths clean but hard. Went to swim in the pool but some dead skin, chemicals or some white film all around the edges...uggghh. In a half full hotel why would they give us a neighbor in the next room? I'm a light sleeper and he threw up from 10pm - 2am! Heard it clear as a bell thru that connecting door! Couldn't sleep well here. I even recorded it cuz it was so unbelievable. Gonna send it to corporate. I travel all year long. I get to stay at so many hotel it's unbelievable. When I get to a hotel I look forward to staying somewhere I can feel at home. When I don't get that feeling it makes me look for that place where I'm comfortable. clean, bur short on parking spots and not the friendliest or most understanding front desk clerks. Maid service was good. Amenities of room were adequate. Hotel sit back off road and is easy to miss the entry point. I highly recommend this hotel especially for families.The breakfast, room and pool was awesome. My grandchildren were delighted. The entire are was clean and all personnel were very helpful and friendly. The rooms were very old and falling apart. The carpet was dirty. Luggage rack old & rusted, leaning to one side. Bathtub & floor was filthy & had mold all over. I cleaned the bathtub and floor with a white washcloth and shampoo when I was finished the cloth was black. The sheets were never changed, I finally took all the sheets off the bed & put a very large note in the room to please change these sheets. These sheets had been on the bed since Saturday, this was now Thursday. We saw housekeeping come out of a room with a cigarette in her mouth and curlers in her hair. I thought what kind of place is this??? There were parties going on every night and a girl was working the parking lot. We paid $120.00 for each night from one Saturday until the next Saturday. Way over priced for this a Best Western to be this nasty. I also left my blanket there, called the hotel back as soon as I noticed. Front desk went to the room and pick up the blanket and had it up front, now it is suddenly missing. Every time I call, no one can tell me where the blanket is. My advice: STAY AWAY FROM THIS HOTEL! SLEEP IN YOUR CAR. Entrance from road to hotel was difficult to maneuver. Structure is more like a motel than a hotel. Rooms need to be upgraded but it was clean and the staff provided outstanding service. Breakfast was typical for Best Western. Everyone was nice for the most part, but when we called the front desk we were put on hold every time and then forgotten about for around 5-10 minutes. Other than that, the room was very clean. It's a very great hotel for the stay. I really appreciated the room amenities and the housekeeping. This hotel was not in the best location though was a good choice for the cost. We were a bit leary of safety at the back of the hotel against woods though everything was very well lit and the hotel was sold out so there was always people coming and going. We felt completely safe. My wife and I were looking for a cheap place close to the beach for our honeymoon and we could not have been happier with this hotel. We will say that the neighborhood it was in felt a little sketchy, but nothing happened in any negative way. My wife and I both agreed that the bed we had was one of the most comfortable beds we have ever slept on, the same with the pillows. In fact, I took my own pillows expecting the hotel pillows to be dreadful. However my pillow stayed on my bag the whole trip, didn't use it. We checked the bed all over and found no stains, bugs or anything of any sort. My only complaint would be that the bathrooms are a little tight. If someone is using the bathroom nobody else can do anything in there, can't even get the door open. Which isn't the end of the world. I was a little disappointed that I was told that we could check in at 3pm, we got there a little after 4pm and we were told our room wasn't ready, so we got some food and came back and it was ready, not a huge deal. As far as the staff, the lady that checked us in acted like we were bothering her as she had someone on hold on her cell phone and rushed through our check in, still not a huge deal. However, the breakfast was actually pretty decent and the 2 staff ladies that were attending the breakfast could not have been more accommodating, one continuously went out of her way to ensure happiness. That included bringing waffles, sausage and eggs to the customers tables when they were ready, she was essentially a waitress and it was much appreciated. The location is 15-20 easy minutes from the beach, 10 minutes to the aquarium. Handful of places that are within walking distance. We will most likely start here on our next vacation. My room was clean and comfortable..and above all...quiet! Breakfast was very good. The staff made all the difference with their friendly attitudes and excellent service. This was a great base "camp" to go adventuring from. when we pulled the covers down there was a piece of stale sandwich in the bed. it was so disgusting i cannot even tell you how gross. it was so late that we just laid out towels and slept on them. we could not wait to wake up and leave. never again will i stay there. This was my first time at this hotel. The location was very convenient for me. The place was clean and comfortable. The staff was friendly and helpful. Breakfast was always good. The price was good. The only issue for me was the pool water didn't seem as clean as it should be. We had a great check in. Front desk at night was nice. Desk area appeared as though it had recently been updated. We went to the room and the floor looked like it had not been vacuumed. There was mold growing in the bathroom, hair in the tub, bedskirt had a nasty stain on it, and there was spackling compound on the rack in the closet. At checkout the clerk was on her phone. She was not friendly, did not say anything, until I told her I was there to check out. Her response was "What Room" after which she said "You can go" once she checked me out, and proceeded to finish her call. I hung at the desk for a few more seconds and told her I had some things I wanted to discuss. I proceeded to tell her what was wrong with the room. Eventually she wrote my concerns down, but when I asked what was going to be done about it she said it was up to housekeeping. There is so much more that i sent to Best Western. Bottom line, the room was dirty and the dayshift desk clerk the next morning - didn't care. Not on my list of recommendations. We stayed for 3 nights and 4 days. Our overall stay was terrible. The key card won't work initially. The straicase was dirty. The room was not clean. The toilet paper holder was coming off the wall. The tub wasn't draining well. "Make Sure You Have a Room - Late Arrival Could mean NO ROOM"
Have stayed at this hotel before without problem. BUT NOT THIS TIME. I booked online through BW using points for a free night the day before my stay. Had a confirmation#. I arrived at 10pm to be told I had no room. They finally acknowledged my reservation but had overbooked the hotel. They finally found a room to give me but because of the lack of key, once I was in the room I had to stay or contact the front desk for their master key. What began as a bad sitution, Raul and Diedre (?) tried to correct - they even compensated with a no charge for the room and reinstated my points. But did not sleep well and still had made me anxious. All future bookings on line I will clearly state arriving late and may even follow up with a call. "Pleasant stay with wonderful staff"
Hotel room was clean. Pool had a moderate amount of debris from the wind blowing but the water was clear and it felt great after a long day. There were a lot of people smoking around the pool which was a little disappointing. The staff at the desk and serving breakfast were fantastic. They were nice, helpful and seemed to enjoy their jobs. The stairwells and parking could be improved but it was close to Pop's Diner which was a great recommendation for dinner. Wish they had a laundry area since we were on a road trip. "Excellent Quality for the Money"
Excellent facility and service quality for the money. Fine breakfast staff and food. Excellent WIFI system. Clean room and excellent daily room maintenance . Comfortable bed. Comfortable desk and desk chair with good lighting for those who need to keep up wiih business. "Complete shambles and the worst customer service"
We had driven down from New York today with an overnight stay at this hotel. I had reserved one room paid upfront no cancellation and one to pay for. We didn't arrive until 7pm after 8 hours on the road only to be told by what I can only say was a callous unhelpful woman on reception telling us...oh your reservation got cancelled. Your card expired. She had a man on the phone she spoke to who was saying the same. I had no contact from them and said well I at least have the room already paid for! 'No Mam that got cancelled ' they genuinely couldn't care less. One poor man at the same time we were there got given three different room keys as each one he was given was occupied! We had no help on what we could do it was basically tough luck! We have managed to get a room elsewhere which is not nice but at least a roof overhead. I would not advise booking this hotel EVER! It looked nice but bitter sweet. Avoid it like the plague Oh btw I have just seen an email sent at midday today telling me I had 2 hours to confirm if room required...with no Wi-Fi I have only just seen this. Cheers!
" Not the best and not the worst"
I recently stayed 2 nights here with my husband and baby. The room was a little worn but met your basic needs. The beds were very comfortable and the linens were all clean. The carpet could use a good cleaning along with the bed skirts but for the cost and proximity to the boardwalk area it's isn't a bad deal. The bathroom was small with only 1 small shampoo and 1 bar of soap provided. The shower had great water pressure and was clean. The pool is in the front parking lot right by the entrance, so it's not an ideal location especially since there is a basic fence around it not a privacy fence but it appeared to be well maintained. The breakfast was a huge disappointment, usually Best Western is better than other hotel chains in this respect but they had the dreaded single waffle maker with a huge line in a very small area. They also offered eggs, sausage and bagels/toast but the line was long and it was uncomfortable to wait in such close quarters. I will say the ladies who manned the waffle maker and refreshed breakfast supplies were extremely helpful and pleasant. Parking was my biggest complaint, we arrived and literally had no place to park. The employee said she had to park at the entrance too because there were no spots available on the property. They clearly need to enforce a one vehicle per room policy like the beachfront hotels because you should never not have a parking space lace to go with a room. Overall I would say this place was not the best and not the worst.....we may stay again if we are in the area. We booked here several months in advance based off the description & proximity to the beach, boy were we fooled! It's not walking distance to the beach, no elevators, rooms not clean & breakfast is terrible! We stayed for only 1 night, just passing through, and it was perfect. It's a little outdated but clean and comfortable. The staff were very nice & friendly, pool was perfect for the kids, beds were super comfy, good breakfast. Thumbs up. I think you should clean the bathroom because the shower had something broken. When we came to the hotel the carpet was wet. It was good to have the free breakfast. I would recommend that the people smoke away from the building because it makes rooms have an odor. Everything was clean the price meets expectations they could use a bigger space for breakfast, it is a 20 min drive to the boardwalk,the new front desk person was very very helpful I give her 5 stars. We expected to be "ON" Virginia beach and not about a 20-24 minutes drive away. My fiance insist that something was definitely missed in the translation when he made arrangements over the phone. Well, that cancelled out my 6 am walks on the beach to watch the sun rise. The staff at the BW was very attentive especially, Jessica the breakfast hostess who made every guest feel special with a warm greeting and lite conversation. The room looked nice when you first entered, but after a day or two you notice things like black mold on the shower curtains, etc. They have on outdoor pool that was being prepared for a opening (still a little cool in early May). There was no gym. It was okay for sleeping, but not retreating. It has a few nice restaurants within walking distance...just be careful crossing. "good enough place for the night"
to choose a hotel, I look for the best reviews at a price I'm willing to pay. So there are probably better hotels in Virginia Beach...but I'm not sure I was willing to pay those prices. So, I have to keep that in mind in reviewing this...I did not choose the most expensive. Having said that, I think this hotel still comes up wanting. It was off putting to have the young woman at check in having a very obvious, very fresh, drippy cold. The room was good. Comfortable...but the toiletries provided were below average. Breakfast was below average even for highway chain pre-packaged overly processed foods. The eggs were a mystery to me. Were they really made of egg? It's difficult if you're looking for low carb, low sugar food. The breakfast space wasn't big enough for the number of people there to eat. It was more complicated by the fact that there were two employees in that small area stocking plasticware (and chatting) while a crowd of people waited to get in. They didn't seem too concerned about the people waiting. And, why was this a two person job? Check out was more pleasant. I may not rush to choose Best Western again. I enjoyed my stay although it was only for one night. Check in was quick and easy and my issue with the key card was taken care of with ease and a professional flair. I would definitely recommend staying at this Best Western again for business. How refreshing to check into such a comfortable room. The mattress was perfect, the room was nice and clean. It smelled so fresh. Parking was so convenient since I was on crutches I could not have asked for more. The manager had promised us one particular room but due to unforeseen circumstances he could not keep the promise. Very apologetic but it was ok life happens. He made sure my walk was not far from the car.He also gave us a little gift bag with popcorn, chips and a candy bar as part of his apology. Loved my weekend stay. The business center was convenient. Fax machine and computer as well as the printer made my trip complete. Thanks I will be returning. Dear Charlotte C.- Thank you so much for the wonderful review! By telling us what you liked about your stay & how we can improve is why we appreciate comments from guests such as yourself. It also pleases us to hear that you were able to make use of our amenities. However, since we're remodeling we just recently temporarily closed part of our business center. Therefore, be on the lookout for a new and improved business center in the future. Please take care, and we hope to see you again for your next trip to the area! Sincerely, Andrea L.C. "Ok for one nite "
If your looking for a responsible priced non nite stop . Then this is it don't plan on staying more than that . Nothing special about hotel but it was clean . Breakfast was some what empty when we arrived at 8:30 am . By that I mean supply's not people. Had cereal, waffles, yogurt , fresh fruit , coffee/tea and juices on hand . What drove me crazy was a glob of syrup on floor that made the whole serving area sticky. Dear gymlady30- Thank you for the review of our hotel. 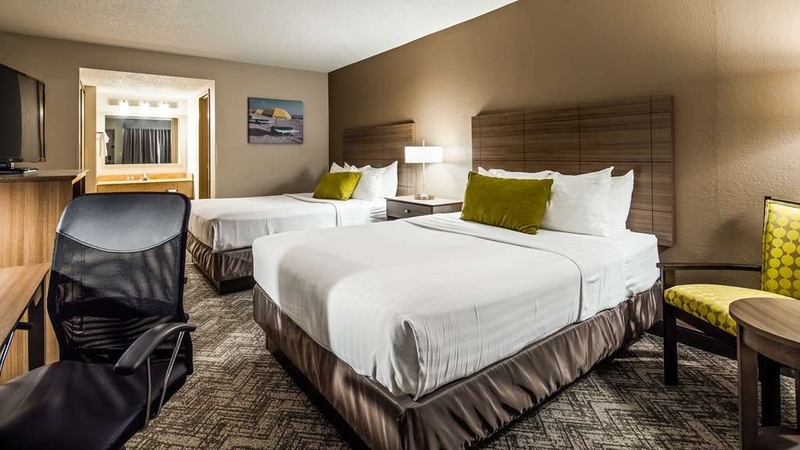 Here at the Best Western Center Inn we pride ourselves on providing clean rooms and great hospitality at a fair price. Guests also love how centralized our location is within Hampton Roads. As you may have noticed during your stay we are currently renovating our property, and we apologize for the issue with breakfast. These renovations (little by little) will impact all parts of the hotel, including breakfast itself. Please take care, and we hope to see you for any future trips to our town! Sincerely, Andrea L.C. I had a good time staying at this hotel. The staff are incredible and very friendly. This place is very quite and it is good for someone who travels a lot and need to relax in a quit place like this hotel. Dear za7a- We genuinely thank you for the lovely review! 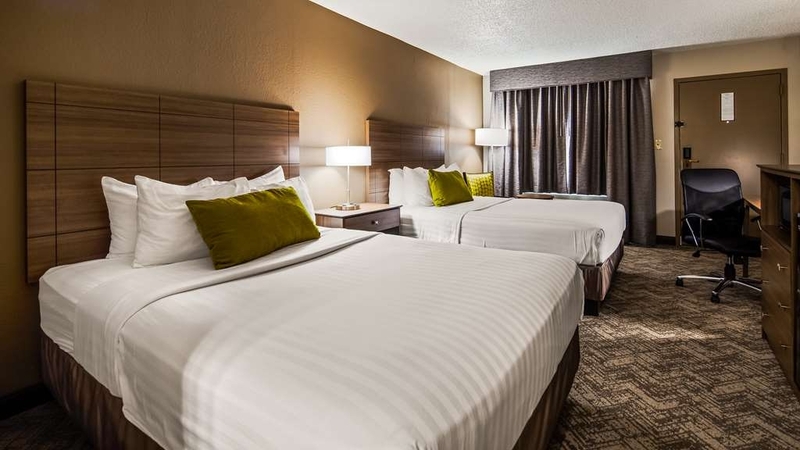 Here at the Best Western Center Inn we pride ourselves on providing our guests with clean rooms and great hospitality. Please take care, and we sincerely look forward to seeing you next time you're in the Virginia Beach area! Sincerely, Andrea L.C. "Terrible stay, Hotel Manager and Owner responsive at fixing problems"
When we checked in to our room - it was filthy. Nothing at all had been cleaned, the beds were used and food packages were everywhere. We asked to be moved to another room, it was clean at least. However later that night, another guest was given the same room as us and tried to walk in to our room. (A good lesion to always set the extra bolt on the door!) My husband did not sleep well in this room and the following morning he asked to be changed to another room. Only the room they tried to move us to - already had other people present!! So now we were the ones trying to walk in! Luckily it was during the day and not at night. Then, the only available room was a smoking room. The front desk staff during this second room change was rude and inconsiderate about the problems we were having with the rooms. The hotel owner was very professional and moved us to a different hotel. Dear Tiffany E.- We apologize for the issues you experienced during your stay with us. Although I'm sorry you had to move to one of our sister properties, I am glad to hear that you found the management/ownership team to be 'responsive' and 'professional.' We're currently implementing several new procedures and changes at our property & hope that you give us another chance in the future. Please take care. Sincerely, Andrea L.C. I was a little skeptical of the location of the hotel at first. It didn't appear to be in the best, nor the worst, area of town, but it seemed a little sketchy. However, the parking lot was clean and it was in the middle of winter so of course things would look barren. What I was pleasantly surprised by was how clean and comfortable the room was for such a low price. It was probably because the room was in the off season, but I still enjoyed my stay very much. The room was not dated, the amenities were nice, breakfast was delicious and gave us good options. The pillows were also so soft I was tempted to take one home! What impressed me the most, however, was how nice the room smelled when I came in the door. I've been in hotels like mold, cigarettes, and kerosene, so it was very nice to come in a room that smelled like apple cinnamon. The cleaning staff there should be very proud. Horrible stay the carpet need to be replaced the drains don't work properly the tub fills while taking a shower the toilet take time to flush and you have to lift the nozzle back up for it to stop running there is no microwave when the pictures show one there was a shooting the night of our stay right around our car and when we wanted to leave we couldn't leave due to an investigation that had to be done and front desk tried to insure us that we were safe and a shooting just took place what a waste of money do not I repeat do not stay here a terrible way to spend a get a way. I would rate it a zero but no option for it . Never again. I had to come to Norfolk for a work related occasion. I went in to the front desk and presented my ID and credit card. I was told, in a rather nasty manner, "I don't need that, your room isn't ready, you need to come back in an hour". While waiting out in the parking lot, I had to listen to employees having a conversation that consisted of no more than a dozen "F" words. The lighting isn't very good in the parking lot and corridors that go to the rooms. My room was clean and kept nicely for the 4 nights I was there. I will choose another place for my next stay. This is a great place for the money. The hotel has easy access to the highway, the rooms are nice and the beds are very comfortable. The staff was very friendly and the breakfast was good with a great selection. I would stay here again. I booked the hotel on short notice.The hotel was in the area we needed to be.Staff was very helpful. The rooms were clean,The shower was great. Not a great location for family travel but good for business. We booked this room through a vacation group site that we are members of. We paid in advance for the discounted rate on 9/28/16. We arrived at the hotel late on the day of check in (I called the front desk to let them know we would be arriving late in the night). They had our reservations, but they told us that the payment from the vacation group did not process. I gave the confirmation of payment and all the information that I had available along with the phone number. The young man at the desk asked that we come back down to the desk the next morning to call the number and clear everything up. I said that was fine. I went down to the desk on Sat morning. I spoke to the girl there at the desk gave her all of the information again. She took the number and said that she would call me if she had any issues. We never got a phone call and Sunday check out day came and we left our keys and went home. I received a call from the vacation club letting me know that the hotel informed them that they also charged us for the room. In order for them to refund us they needed a receipt. We were not informed that the hotel charged our room. And now we are having to jump through hoops to be able to get our money back. "For Republicans who like FOX TV"
This hotel does not have sound on the FOX Business or FOX Channel. Every other channel has sound. This forces viewers to watch other "main stream, drive by" liberal media news channels. Also, breakfast is not "served" it is offered. Also, all room entrances are on the outside of building. NO interior entrances. We always stay at this Best Western on our way south. The rooms are spacious enough for us and clean. The staff is courteous and helpful. It's a short trip to the Virginia beach area and to many restaurants. We especially like that it's located right off the bay bridge and tunnels. It works for us! Anytime I visit Virginia Beach, I choose this Best Western location. It's close enough to all amenities and places I need to go. It's quiet and clean. I strongly recommend this location. It won't disappoint you! We reserved a 2 queen room. Upon entering any room, we always check the beds. When we checked the one queen, there were about seven strains of hair on the bed and on the pillow. The other bed was fine so we slept in that one. The linen rack in the bathroom was falling off the wall and there were stains on the floor. It just had an overall dirty feel to it. When it was mentioned to the front desk, they basically ignored us. I will not be going back there. The best thing about the room was the baloney. It had a great view of the beach. "Andrea the manager is super helpful"
While the room was basic and the linens could be replaced, this hotel, and Andrea in particular, saved us when we needed a place to stay last minute due to the recent hurricane. Andrea ensured a pack 'n play was available for our toddler to sleep in and kindly helped me in my frazzled state by phone from the airport. A good value for the price and kindness, especially when in a bit of a crisis, goes a long way. This place was great. The staff were very friendly. We only stayed one night while passing thru. The outside doesn't look like much, though the pool appeared clean and well maintained. Inside was very nice. Good basic amenities including coffee, microwave, and fridge. Everything was very clean and very comfortable. For the money I was expecting much less, but I was very pleasantly surprised. Came here just for a place to sleep the one night. The staff was super friendly and the room was decent. The outside looks a little run down but the rooms are better. When I got into my room the air wasn't on so it was pretty stuffy but it cooled down quickly. Some lights didn't work but the beds were pretty comfortable and it wasn't noisy. "Best hotel, friendly & close to all the attractions"
"Affordable,clean,nice breakfast and friendly staff"
Celeste met us at the desk and was very friendly and helpful with a big smile on her face. She advised us of all the amenities and showed us how to get to our room.She also offered us a free cup of coffee which we needed badly after traveling.The room was clean and comfortable and the are quiet. I will definately stay here again. "Clean and good price. " We stayed here two different night on our way to a wedding in Corolla Beach North Carolina. Hotel was good nothing fancy but rooms where clean and beds where comfortable all for a good price. Did have the complementary breakfast it wasn't terrible either. Also it's not far from the Norfolk airport. This hotel has comfortable rooms although a little dated but clean, a nice pool, a complete breakfast buffet. The staff all very friendly and quite helpful. We really enjoyed our stay here, it was a nice vacation and the rates were reasonable. "Best Western Center Inn, a good hotel worthy to be revisited"
It was my 1st time to stay in Best Western Center Inn hotel. The bedding and the room are comfortable and clean. I slept very well in this hotel. The internet connection is fast. Breakfast is good and it will be better if a few hot items were added to it. The hotel staff was very helpful and considerate to give me a late check-out as well as interesting places for visit. Overall, I strongly recommend this hotel for summer vacation in VA beach. We stayed one night while on a road trip. The room was clean, the shower was great, the beds were average. The breakfast that was promised was beyond disappointing. At 7 am there was 1 apple, two slices of bread, 3 sausage links and water to chose from on the buffet. There was no attendant and they were supposed to have started serving said breakfast at 6:30 am. There were several people sitting around waiting to see if something more was coming but we needed to get back on the road so left hungry and certainly not happy. I would like to say that Celeste from the front desk was very professional and helpful and we appreciated her!! "Better quality for the price"
You get more quality for the price than the alternative hotels that are closer to the beach. I did not need to drive very far to the beach (~20min). Kind of hard to find since it sits back from the road. I would stay there again. Great room for the price in this area. We paid $126 for 2 queens on Kayak. Very clean room, comfortable beds. Also, the front of the building is not indicative of the rooms. The pic listed is indeed photoshop! Construction woke us up at 8am. Breakfast was a bit disappointing, at 8:45 everything was pretty much gone. Best Western really needs to be willing to replenish items as this is a consistent complaint I've seen in reviews. . .
"Not the one for value"
The beds were comfortable. The bed linens were old and pilling, rough feeling. The towels and bathroom was very clean. Desk plug-ins and lamps not working. Thankfuuly AC was great. The bathroom had been updated a while back with granite countertops. But it was so small one had trouble closing the door while standing inside. We had a quiet upstairs room 231 with new looking furniture and roomy. This is a very old style place w all exterior opening doors and no elevators. The exterior was poorly kept, dead plants in pots, and the pool was not being kept clean very well. Something had died close around the back parking and smelled really bad even our you get boys noticed the powerful offensive smell. The staff was confused on the breakfast hours and at 9am many things were empty - milk, waffle mix, etc. When asked some items they were 'out of' for the day. This was an almost $200.00 room. Not worth the price at all in stay, convenience to anything, or service. "Budget option for family stay in Virginia Beach area"
We are a family of 4 who went on a lengthy road trip. We look for budget options, but with amenities & cleanliness in mind. The hotel is about 30 minutes from the main areas we visited (Atlantic City boardwalk & Sandbridge Beach). Breakfast was decent - regular standard fare for a hotel that includes breakfast. We found the room to be larger than normal which was nice - & it was clean & comfortable. Also had microwave, fridge & safe. There was a small outdoor pool which we did not use since we spent most of our time at the beach. Only complaint - & this is not the hotel's fault - there is construction going on adjacent to the property that started at 6:30am which gives quite a wake-up call, esp since the rooms open to the outside. Found staff to be very friendly & helpful. Decent place. "Decent Hotel, Booked in a Pinch"
We arrived in Virginia Beach and had to cancel our reservation due to severely unclean rooms. We booked this room in a pinch and it was adequate. The room was clean, and the property was nice. It's certainly not the 5 star hotel where the guy opens your door and carries your bags, but it was probably 1/5 the price of all those amenities. So, if you're looking for a clean room, and great staff to assist you, stay here. Oh, and they offer free breakfast too!! "Not for families with kids"
Well, where shall I start from? First of all, the picture posted here on trip advisor is photoshopped! The exterior of this hotel looks nothing like the photo, except for the entrance canopy. We booked our stay ahead of time based on the reviews here and the photos. As soon as we arrived we were shocked! Apparently the hotel is a known hotel for truck drivers where they stay overnight during their trips. There is a parking issue due to the huge trucks that are parked every where. The rooms are small and you can see guys hanging around everywhere with no shirts on, just standing or smoking and watching other residents going in and out. You could also see the trash cans filled with empty beer cans everywhere. We had to stay the two nights that we booked ahead of time because the management refused to cancel our booking and insisted that they won't give our money back if we chose to stay elsewhere. Anyway, if you have kids with you, don't go there. We didn't feel it was a safe environment, and we will NEVER use Best Western hotels ever again anywhere in the future. Loved our time at the Best Western Center Inn at Virginia Beach! 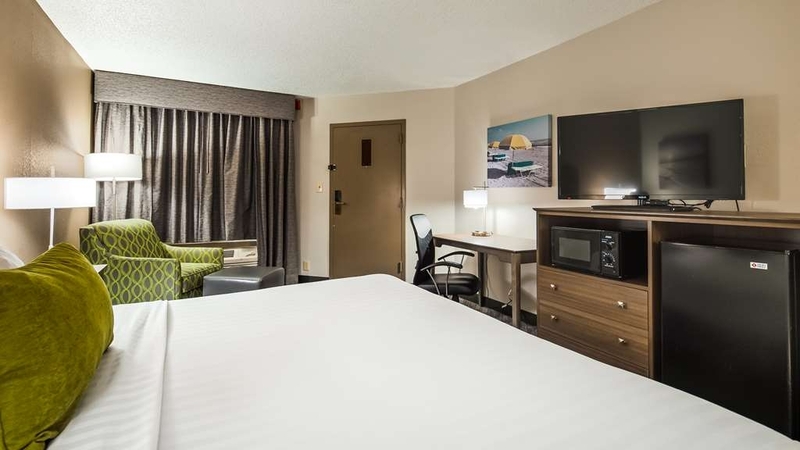 Nice and clean, super friendly staff and centrally located to beach, great restaurants and historical sites made this hotel a winner in our books! This hotel has wonderful employees. And the most comfortable bed I've ever slept in at a hotel. I don't usually stay in hotels where the doors open to the outside but this Best Western was terrific. It was clean as a whistle and though a bit dated it was very comfortable and nice. I would give it 5 stars but the A/C in the room wasn't cooling the room, I asked the front desk about it, they sent the maintenance man, it needed a part so they gave me a 15% discount since it couldn't be fixed until after the time we were checking out. Definitely recommend this hotel. 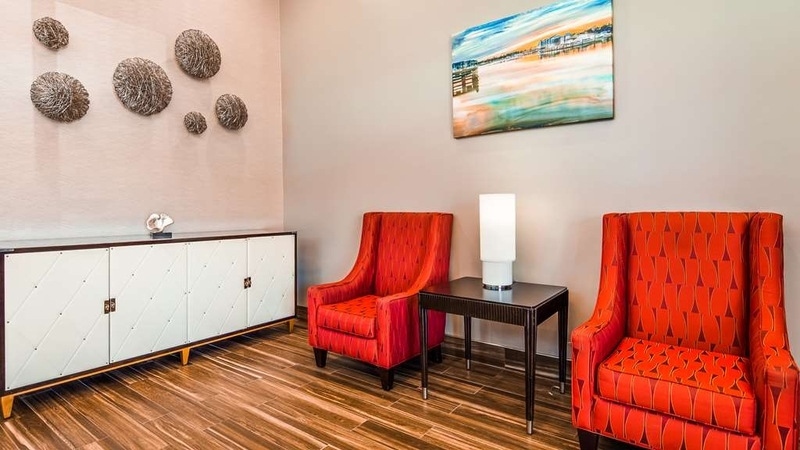 "Clean room and super friendly staff!" Check-in was simple and front desk staff were very pleasant. We had accidentally booked a smoking room and they were very accommodating and moved us to a non smoking room. Pool was nice...the front desk clerk was also kind enough to give us each extra towels to dry off after a swim! Staff very friendly. Clean rooms. comfy bed!! Breakfast was nice but very little room to maneuver when other people are fixing their breakfast too. cramped! pool was a little small but accommodating and my kids loved it. very relaxing! A nice break from the ocean. Room and service is perfect. loved the place. Really quiet room with pool and stuffs. Have coffee machine and irons for you clothes. The bed is quite comfortable with tv and wifi free of charged. Next time i come i will go here again. "Virginia Beach Northampton Road Best Western"
Best Western Center Inn in Virginia Beach Northampton Road was a pleasure to stay at. Staff went above and beyond there to make sure we had everything. We will definitely stay there again and recommend it to others. The rooms were nice and Very Clean they have an awesome. Staff there. I am always loyal to the Best Western brand of hotels and have been for over 30+ years now but this hotel experience is one (1) of two (2) great experiences that I have truly enjoyed my stay. Thank you! After coming from the Best Western in Virginia Beach this was a much more comfortable stay. The rooms are big, clean and nice. The staff was very helpful with anything we asked for, even changing our room from the second to the first floor. It was quiet and nice. We enjoyed our stay there very much and will be back when we visit family again. "Best of the Best Westerns yet!" Pleasantly surprised by this hotel. We found the room to be clean, neat, organized and the staff incredibly kind and efficient. The breakfast served in the morning was staffed with helpful staff, courteous, and consistently cleaning the area where the food was served. Great service, great staff. So worth a visit! Our room was pretty nice with all the amenities offered present such as refrigerator, microwave, hair dryer, etc. We found a great pizza place around the corner so we were able to eat comfortably in our room. The breakfast offered was plentiful and delicious. We would definitely go again. "Older unit but clean with great staff"
This hotel was in a good location for our trip. It was an older hotel, but was clean and the staff is great. Breakfast was ordinary and fit the price and even though there was a large group staying at the hotel the breakfast stayed open the entire time. This place was okay for a one night visit. The only problem I had was that the rug was really dirty but that is just the one room I was in. Cant speak for other rooms. I went during the cheerleading competition, monster truck, mothers day and rooms were limited because I waited too long to reserve a room. This hotel is in an excellent location for travelers. The employees are very, very nice and helpful. Our room was comfortable, spaceous and well decorated. Breakfast food (waffles and sausage) was not good at all. The staff of BW Center Inn were very friendly, from making our reservations to check out, they were amazing! Our room was clean and welcoming. We had an amazing stay. We would highly recommend this hotel! I reserved 2 rooms, one for my mother and one for myself. Mom called them and had her room changed to her name. She later called to cancel as they couldn't go on the trip. Upon arrival, I found that they had cancelled my room as well because they changed both reservations to my mother's name and then cancelled both rooms. The was very inconvenient. The girl behind the counter argued with me instead of just trying to fix the problem. The room smelled and the bathroom was filthy. "Great room at a reasonable price"
We had 3 adults attending a conference in Norfolk. The room was clean, comfortable and had plenty of desk and table space. We asked for a quiet part of the hotel and they gave us a room in the back - very quiet and even called to ask if we had everything we needed. The breakfast was good and the staff was very friendly and responsive. Great value for the price! I will not stay at this particular hotel till they get it all cleaned up. I was too tired to leave the hotel after going into the room that late night. For the price, you should have at least given me a cleaned carpet. "Great stay for the dollar"
They had everything that I needed for my trip, the bed was somewhat uncomfortable but overall a most enjoyable stay. The site was in the general area of my venue. All the needed conveniences were near the hotel. Again, great stay! Stayed Friday April 22-24. Left my room Saturday around noon and left the do not disturb sign on the door. Returned around 11:00 pm and the sign was laying on my unmade bed. Also the toilet was running and checked and the handle was broken. Called the front desk and told what happened and she never once apologized or offered to put me in a different room. So I spent the night with no toilet and listening to running water all night. And also my can drinks froze in the refrigerator. Terrible motel. Stayed over on the way to the Outer banks. Fast and easy check in. Front desk attendant was friendly and helpful. 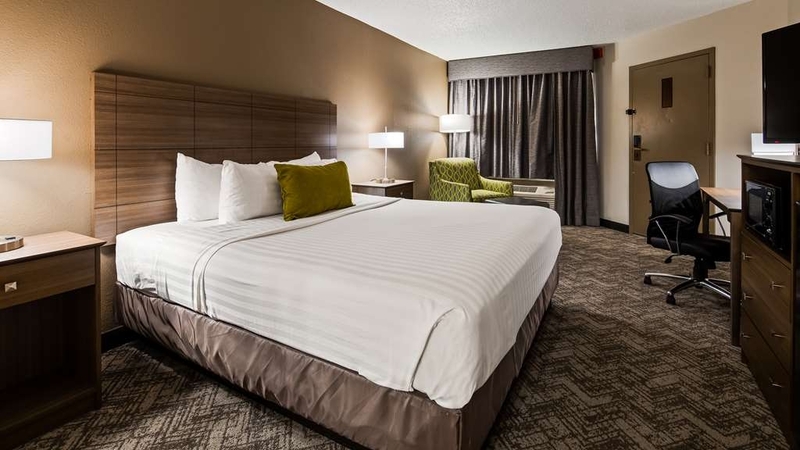 Convenient location, clean rooms and super comfy beds! Breakfast is a nice perk before hitting the road again! ???? Would definitely stay again. I stayed here for a couple nights and I enjoyed my stay. In the beginning, I was a little upset because the pool was closed (I never inquired about whether it was open or not beforehand...I just assumed it would be since it was hot)....and because the smoking room that I reserved was not available when I arrived (due to plumbing issues that were out of their control). But the staff was very very friendly and went above and beyond to make up for the room issue. So I was only mad for like 30 minutes lol. There's plenty of parking, which was a big plus for me. The hotel sits back from the street too so there's a sense of privacy that I liked. Also the rooms were very clean. And there was no noise issues either. I would stay here again. I was unsure how my stay was going to be once I arrive at Best Western but was relieved by the friendly staff and clean accommodations. The bathroom was mold free. The shower curtains had no visible dirt or mold. I was very happy with my stay. "For the price: excellent hotel with great staff!" Can't beat the price and the hotel staff was friendly and courteous! Check-in was easy and the breakfast was excellent! Would stay again if in the area! The hotel sits a bit back from the road, so don't be discouraged by this. There is not a lot of parking, but we always had a spot. We stayed March 31-April 3, and the pool was not open. But all in all: a great price, great staff, and a great experience! I stayed here for a couple of nights. It is an older place but they are working on it. My bathroom was updated and newer beds but still an older feel. Clean with friendly staff. If you are looking for something in the area but not on the beach for a night or two consider this place. Hotel experience was excellent! Great value. Bed so comfortable & room so quiet it seemed like we were the only ones there. Immaculately clean. We were so pleased I will check Best Western first in the future. Had a great experience with this Quality Inn. Will consider this in the future. Wonderful guest service. Room very clean. Everything in working order. Desk staff were terrific. Made sure that everything with our room was in good condition. Great service and clean rooms with all the amenities at a great price. Recommend staying here when visiting the Virginia Beach area. Even though Northampton Blvd. is a busy road, the hotel is set off the road so traffic noise is not an issue. Good hotel. Clean and well maintained. Courteous and helpful staff. At check-in I was asked about my room preference and given options. Breakfast items were available before breakfast hours, which was nice as I needed to be out before 6:30. Staff were proactive and very interested in the comfort of quests. When a group of people at a neighboring hotel were becoming too loud the staff member noticed this and called to report it to the hotel staff. I was very thankful as the music was ridiculously loud. I have stayed at this hotel before, and have always been very pleased with the professionalism and helpfulness of staff. "Our Home Away From Home (Florida)"
We have been staying at The Best Western Center Inn since my parents moved to Virginia Beach in 2001. Mr. Patel and his staff have always been friendly and accommodating! Great shower head, a rubber mat provided for safety in the shower and comfortable beds. We find the price to be reasonable and like the central location. On 11/6/15, we flew into Norfolk and checked into BW on Northhampton abou 12:30 am on the 7th. Had it not been so late we would have left immediately. The carpet in Room 133 was so dirty our feet stuck to it. The room smelled stale. And a bug was running around on the vanity. When we stepped out of our room to go to breakfast the next morning, we were greeted by a revolting stench like something had died. But it didn't kill my appetite. The breakfast choices were so meager and unappetizing, I'd have had no appetite without the odor. Never again! We stayed here one night on our southern road trip. Absolutely a bargain! We paid $70 and had a clean room, free WIFI and full breakfast. The staff was very friendly and helpful. Perfect stopping place after crossing Chesapeake Bay Bridge Tunnel. It's not fancy but very adequate, clean and comfortable for a night's stay. Very helpful staff. The rooms were clean and the beds were very comfortable. They had a full breakfast bar. They had Wi-Fi in the room. The lobby also had computers for use. Overall a nice experience. I have stayed at this hotel twice and have a very good experience there. Everything was really good and the staff was very helpful and friendly. The only complaint I had was that they didn't maintain the breakfast station and the food. My boyfriend and I stayed here for one night during Hampton University's homecoming and to my sure pose it was a pleasant stay. The young lady at the desk that checked us in was super sweet and helpful. The people next to us had children in a room alone (teens) and they screamed and ran up and down the sidewalk and stairs all night. We were able to fall asleep thankfully but it was a bit annoying. The area looks a little sketchy but we felt safe. 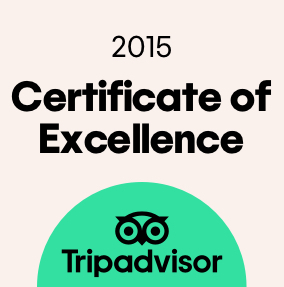 Great experience overall and would stay again if need be. This hotel is small and off the main street. A bit tricky to get into. Employees were all nice and friendly. There are a lot of food choices within driving distance. Perfect location if you have work in the area or are visiting once of the many military bases in the area. Beds are very comfortable and the shower was very nice. We booked rooms at this hotel for 10/2-10/3 and had to cancel due to work obligations due to the weather. Even though one of the rooms was non-refundable rate the hotel graciously cancelled our reservations and provided personalized phone calls to let us know the transaction had been approved for cancellation. The customer service line was extremely helpful and understanding and the manager, Andrea, at the hotel was very courteous as well. We will definitely plan to stay at this hotel if we return to the area at a later time. I booked a room for oct 2-3 2015 and then a hurricane is forecasted to hit VA. The hotel refused to change the dates of my reservation! I prepaid for the room and was REFUSED a refund! No accommodation to change the dates of the reservation or give a refund! My colleague and I reserved 2 rooms here the night before an early morning meeting. We arrived and checked in around 6 PM. Andrea at the front desk was very friendly and helpful. One of the only negatives about the hotels is the way the rooms are numbered. It's kind of like a maze, so a diagram of some kind would help. When we found our room, the power was out. This was a regional power outage, no fault of the hotel. So we dropped off our things and headed out to find a place to grab dinner. When we returned and the power was on, I saw that my room had not been cleaned. So, Andrea immediately put me in the room next door and said she would look into why housekeeping had skipped that room. She also called the new room to make sure everything was okay. And it was. The rooms are spacious and comfortable. They have been recently updated. The next morning, breakfast was good. Eggs, bacon, waffles, pastries, etc. When we checked out, Andrea was back for a morning shift though she had been working the previous evening. Again she was friendly and helpful. She even gave me a card for a 20% discount for a future stay since my original room had not been cleaned. I never complained or anything. I have to say that the hotel management is very lucky to have this young lady working for them. She is professional, friendly, and helpful. Front desk staff are usually not this helpful unless you are at a luxury resort. It is not beachfront, but if you are looking for a clean, comfortable place this is it. For my short business stay, it was just right. Very good stay. Room was down stairs which helped people over 65 years of age. The young lady at the check in counter was very helpful. When we found out that we needed to stay another night she was willing to help us stay in the same room so we could not move just for one more night. "Best Western North Hampton Blvd"